I love being a girl. I really do. But that was not always the case. When I was younger, I hated it. I used to pray at night that I could be turned into a boy. I was always told I couldn't do things because I was a girl. I couldn't go hiking alone, because I was a girl. I couldn't go camping because I was a girl. I couldn't do a lot of things because of my gender, and so I hated it. I loved being outdoors, and being independent. I envied my brothers their freedom. And then, one day, when I was 23, I had an amazing moment, where, for the first time in my life, I was glad to be a girl. I am starting to wonder about that now. 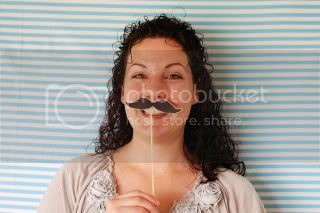 Evidently, I wear a mustache very well. I never thought I would, but the proof is in the pudding. Who would have thought? It is such a sad truth. And a big fat stache for that matter. Sigh. Looking at that picture, I really feel like I am the cartoon. Moving along, Evelyn of Hanging by a Silver Lining had a few questions I want to answer. I have so many, it isn't really fair to just choose two. But one song that always makes me smile is Fields of Gold by The Police. Lately I have had The Boxer by Simon and Garfunkel stuck in my head, and to rock out too, I would have to say Eye of The Tiger. How can you not move when hearing that song? I ask you! Ugh. Faye is going in for surgery part two next week. I went to the dentist this week and learned I may need a root canal. So not excited for that. And our car is on the verge of dying. So, I am praying it will somehow heal itself and at least last until Jeffrey finds a job, and gets a few pay checks under the belt. I went in for my weekly check-up and my doctor said "Holy cow! You are at an 8. Go to L&D right now!" I so wasn't expecting that. Also, they messed up on the epidural. I will never again have one. And here I had been conditioned to think it was impossible to have a baby without an epidural. Pshaw. Then the most surprising thing of all was when they took him away from me and put him in NICU. I wasn't expecting that one at all! Lucky for me, I have a recipe blog. So, just go there and take your pick. I would say the Cafe Rio burritos are awfully easy (think I have promoted them enough yet?). The Roasted Zucchini sandwiches are among my favorite, and when I don't have much time, I make Skinny Enchilada Soup. Well, Faye is asleep, and Keith is playing, so I haven't done much awesomeness yet today. We will be going to the library, though. Does that count? I am a pretty low key kind of girl. I don't have things I always take with me. I quite often forget my phone or wallet even. So I guess I would have to say my sense of humor, gratitude, and a pair of comfy shoes. An Affair To Remember. Wait Until Dark. Casablanca. Laughing at awkwardness. Typing (60+ wpm, baby). Playing the Polly Anna Game. Just three? I am going to just say the whole night was awkward! On a new topic, Emmy Mom also has a meme for Proud Mommy Moment. Today, Keith read 6 words. I was so happy and proud of him! Eye of the tiger!? YESSS! sorry to hear about the epidural story...my experience wasn't that great the second time around, but I don't think I could ever do without one. Ohhh I have to check out your recipe blog because I like easy meals. Wow Keiths birth was not much fun. And so cool that he read 6 words! loove the stache...like a lot! I'm going to have the Eye of Tiger song in my head all day. My groovin' thighs thank you. I'll send a prayer out for all of you dreadful things--those do not sound fun. Thank you for linking up with PMM! Reading six words is definitely something to be proud of. I'm always amazed when I listen to my son read! By the way, I love the little story in your sidebar about how you came up with the name for your blog. So sweet! And I will keep Faye in my prayers next week. This post really made me smile! I love your confessional in the beginning about wishing you could be a boy. Funny pic too! Love ya! So fun! It's so fun to learn things about you. About your car... what is it doing? I have a mechanic hubby and father. Maybe we could help you from far away. I even have a mechanic nephew that lives in Clearfield that could do the work over the phone with my hubby... I hope we can help you! Oh to be at an 8 and not realize it! Thank you so much for joining in!! Loved your answers! !